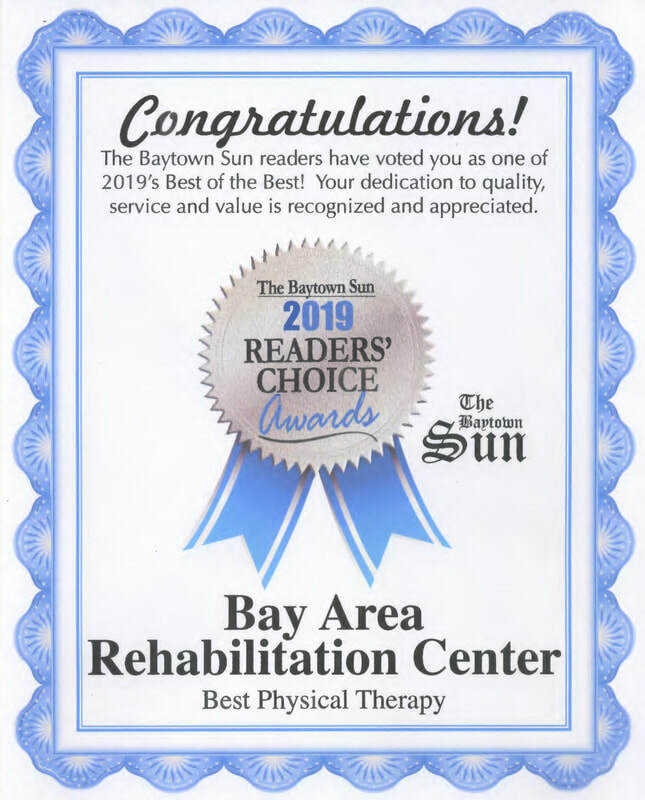 “The Mission of Bay Area Rehabilitation Center is to provide outpatient therapeutic, vocational, social skill training and recreational services for persons with disabilities or injuries and support services for their families." Through our physical therapy department we now offer functional dry needling. Dry needling works, through the insertion of needles, to reduce pain, muscular tightness, swelling, and can work to restart the body's natural healing process. Any therapy discipline can receive this treatment with a doctor's specific orders. If nothing else has helped to reduce your pain, give dry needling a stab! Please contact Bay Area rehabilitation Center to request more information and education on this type of treatment. Hello and welcome to Bay Area Rehabilitation Center. I am the Executive Director and would like to share with you a little information about this organization that I hope will inform and educate you about what we do and who we serve. Within this website you can find more detail about each program I mention. Bay Area Rehabilitation Center, a 501(c)(3) non-profit organization, was originally formed in 1948 by a small group of parents with a common interest and concern—the lack of affordable and local care for their children, all of whom had cerebral palsy. Since that early beginning almost seventy years ago, we have evolved from the Baytown Spastic Association to the Baytown Society for Crippled Children and then in 1979 we formally became Bay Area Rehabilitation Center (Bay Area). As has our name, Bay Area the organization has also evolved over the years. Starting as just a center to assist with cerebral palsy, we expanded to provide medically based rehabilitation services (physical, occupational and speech) to any child who needed that type of service, regardless of the family’s insurance status or overall ability to pay. In the mid-90’s we further expanded by introducing Adult therapy services using the same guidelines as our pediatric program. Soon after and still within the Adult program, we began to serve some of our local business and industries, through providing physical pre-work screening for select jobs, return to work testing and conditioning for those injured on the job, as well as therapy for those with job related injuries. Finally, our most recent expansion occurred in 2007 when the former Baytown Opportunity Center, an independent and local non-profit agency, was brought into the folds of Bay Area as major program. Within the Opportunity Center Program we assist adults, who typically have mild to severe mental disabilities, learn how to better adapt and live in the world around them. Within those guidelines, we have a number of licensed physical, occupational and speech therapists as well as trained staff who work together to provide the best services possible to those clients in need. In order to meet the needs of all clients, even those with limited finances, we reinvest operational revenues back into the organization to support our financial aid program. We utilize contributions from the local and surrounding communities and have had the good fortune to receive funding from the United Way of Greater Baytown Area and Chambers County as well as United Way of Greater Houston, all with the objective of ensuring that no person who has a true need for our services will be forced to go without needed services. We provide services in five different areas: Pediatric Outpatient therapy, Adult Outpatient therapy, the Opportunity Center program as well as Aquatic Exercise, which is performed in our 25 meter heated therapy pool. Lastly, but certainly not least, we provide service to children who are newborn and up to age three in our Early Childhood Intervention, ECI, program. In our ECI program alone we provide services primarily in the home of the child, whereas all other services are provide at our 5313 Decker Dr, Baytown, TX address. Most of you will never have a need to take advantages of what we do, and for that reason you should consider yourself fortunate. For those of you who may have a need, great or small, my hope is you remember Bay Area Rehabilitation Center. For anyone interested, we welcome all visitors Monday thru Friday between 8 am and 6 pm. Thank you for visiting Bay Area Rehabilitation Center! Our patient, Sydney, set a goal for graduation that was much more difficult to attain than most. Watch how Sydney works to attain her graduation goal through hard work with our Director of Outpatient Therapy, Dr. Bill Owen. Bill even walks at graduation with Sydney. Bay Area Rehabilitation Center has been providing quality outpatient occupational, physical, and speech therapy services for children and adults since 1948. Bay Area also provides adults with disabilities site based services, day habilitation, vocational training and job placement. Your financial support of our programs provide major benefit to those individuals with disabilities who depend on our services to aid them in living a more productive lifestyle. Bay Area is an accredited charity by the Better Business Bureau. Please consider making a donation to Bay Area to assist us in our important service of making disabilities become possibilities! You can donate with your credit card on a secure site by clicking on the donate button below. You can also make a contribution by check by clicking on the Donate link at the top of this page.